Dana White Returns to Ring of Combat | Lou Neglia's Ring of Combat | Next Generation of Mixed Martial Arts! It is OFFICIAL, Dana White returns to the east coast when he brings his web series, Lookin For A Fight, to Ring of Combat 59. 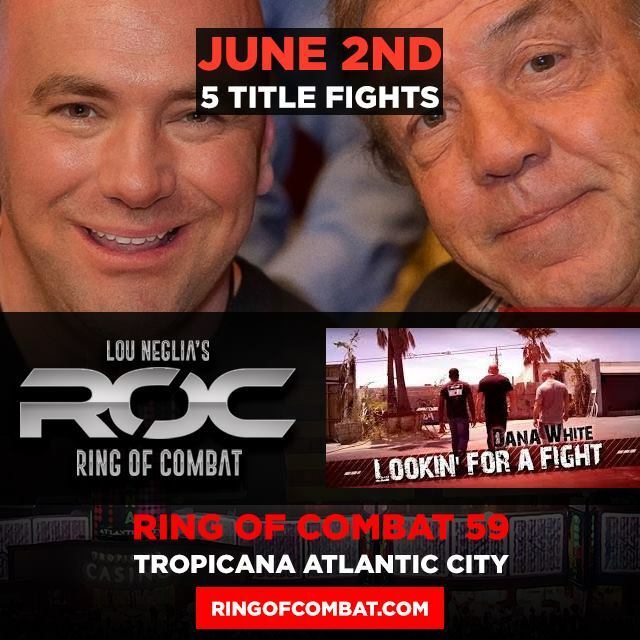 "I am excited to have Dana back in attendance for this exciting fight card," said Ring of Combat president, Lou Neglia. "Ring of Combat has always been UFC friendly as over 100 fighters have gone on to compete inside the Octagon with Matt Serra, Frankie Edgar and Chris Weidman becoming champions. With the fight card assembled and so many great fighters set for ROC 59, I am confident Dana will find more than one fighter for UFC rankings." ROC 59 is stacked from top to bottom with five title fights. Tickets are available online at the ROC website, the Tropicana box office or any TicketMaster outlet. ROC events have a history of selling out so get your tickets today!